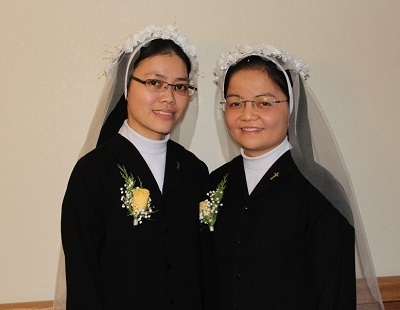 The call to religious life is a gift from God. It is a continuous conversion of heart and mind basing on a loving response to a call of God. As a religious sister, perpetual profession is a sacred commitment to dedicate the rest of her life in service to God and the Church. For each one of us, perpetual profession of vows is not an end in itself, but rather, it is the beginning of our lives as sisters of the Lovers of the Holy Cross. By saying a YES to God’s call through perpetual vows as we celebrated on December 28, 2016 at the chapel of the Missionary Benedictine Sisters in Norfolk, we accepted Jesus Christ-Crucified as the center of our lives and observe the spirituality of Bishop Lambert de la Motte, the founder of the Lovers of the Holy Cross. Our hearts were truly filled with joy and happiness that overflowed within us. We thank God for accompanying us in marvelous ways. We have experienced the hand of God in joys and sorrows, in good times and in difficult times, on our journey. We especially feel God’s hand and love through the community, which we are living – the Sisters of the Congregation of Missionary Benedictine Sisters in Norfolk. Words of thanks, of course, cannot express our deep gratitude toward them for accepting us to live in the atmosphere of their community. They not only have helped us to grow spiritually, but also have helped us to improve our talents through education. We appreciate everything they have done and the time they have taken to invest our future. We know that our journey is long and challenging but their assistance will make it easier and sweeter. From the bottom of our hearts, we want to say a big thank to each member of the Congregation. Without their support and loving care, we could not be what we are today. May God continue to bless them with lots of peace, joy, and happiness in their lives. The Lovers of the Holy Cross Kien Lao-Bui Chu, Vietnam.